Challenged by how to identify since early childhood, four fearless transgender young adults defy societal norms to be their true selves and become more visible. No transition is easy but some are easier than others. We follow Sean, a transgender male comedian from a small affluent town in upstate NY, Katherine, a Bangladeshi transgender girl from a close-­‐ knit Muslim family, Olivia, who had to leave everything behind and enter the shelter system in order to be the woman she knows she is, and the unforgettable Morgin, a fully transitioned woman pursuing her musical ambitions and making her way in the world. 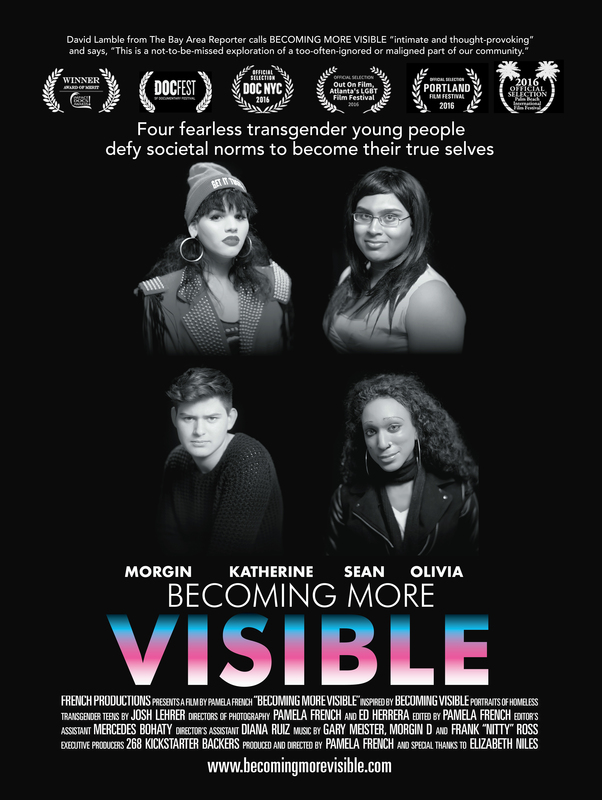 BECOMING MORE VISIBLE showcases both male to female, and female to male trans kids. Each is at different phases in their transition and with different levels of familial support. We follow them and watch them grow into and become their true selves. BECOMING MORE VISIBLE also introduces avenues of support for this population. While it is a hot topic, it is still widely misunderstood. BECOMING MORE VISIBLE shows what it means. It shows the challenges and joys of being your true self. According to some reports, an estimated 2 to 5% of the population is transgender or feel some gender dysphoria. 1 in 4 who identify as transgender have experienced homelessness. (transequality.org) 41% of transgender people attempt suicide. (The Washington Post) These are astounding numbers. BECOMING MORE VISIBLE hopes to normalize what it means to be transgender, thereby reducing the stigma and these statistics. The film follows each of our featured young people as they transition into their authentic identity. We take an intimate look at the lives of these young adults as they transition. Their stories are taken out of the fringes and placed into everyday, relatable life. We hang out with these kids in their bedrooms, doctor’s offices, support groups, Pride events, as well as at public speaking engagements, in subsidized housing projects, well-­‐to-­‐do homes, and on the streets of New York. They open up about their fears of not being accepted, the difficulties of transitioning, the loss of connection with their families, financial and healthcare issues, discrimination and thoughts of hopelessness and suicide. We see their struggles first hand, and also their delights when their bodies and minds begin to match for the first time.